The size of the tumor changed from June 30 to 28 Oct. 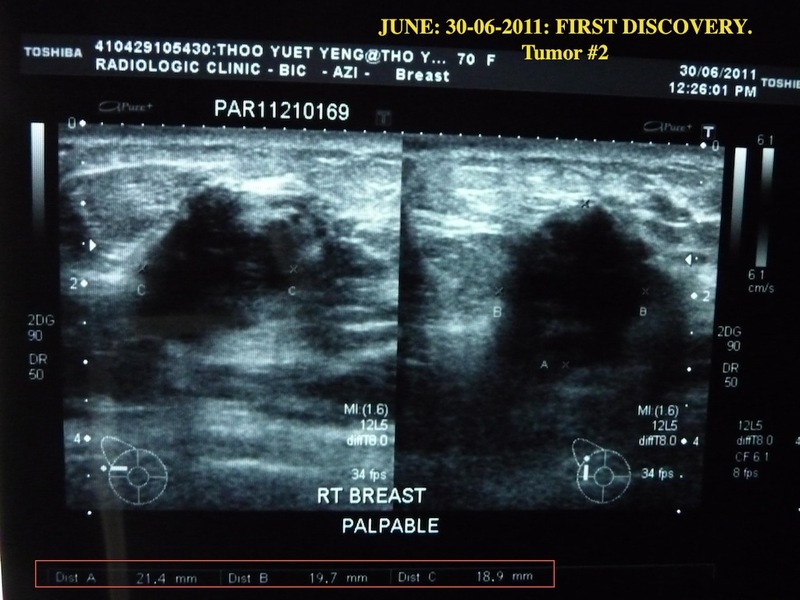 The volume of the tumor is calculated by multiplying the Length x Width x Depth dimension of the Ultrasound measurements. It shows a slight decline from June (first detected) to Aug 13 (immediately after 1st NGPDT treatment). It increased till 1 Sept 3 weeks after NGPDT treatment. Mom went through a 2nd NGPDT on 5-13 Sept. 4 weeks after the 2nd NGPDT treatment, tumor volume decreased in 28 Oct.
Well, is this good? We will only know for sure after the PET scan to show the actual activity within the tumor. Size is only 1 dimension to indicate the severity of the cancer. 28 Oct: Today, we had an Ultrasound scan done for my breast. This is 88 days since I started the first NGPDT treatment, and it's 130days since I found out I had breast cancer. I am still feeling good. But how's the tumors inside me doing? Well all of you might be waiting to find out, here are some photos for you to compare. I have not met the doctors and not gotten their diagnosis yet. 29 Oct. I consulted an Oncologist at Gleneagles hospital today to analyse the ultrasound report. We agreed that it's hard to determine whether the tumors had increased or reduced in size. The previous 2 tumors (in Sept) were measured separately (3.66x3.63x2.54cm and 2.03x1.62x1.81cm). If we add up both nodule's the dimension would be 5.69x5.25x4.34cm. Compared that with the most current tumor taken yesterday, Oct, whose dimension is 4.1x3.9x2.9cm, it seem that the total tumor mass have shrunken slightly. By itself, this tumor is larger than the previous ones (Aug - see pic below)- hence there is still danger that it is growing. 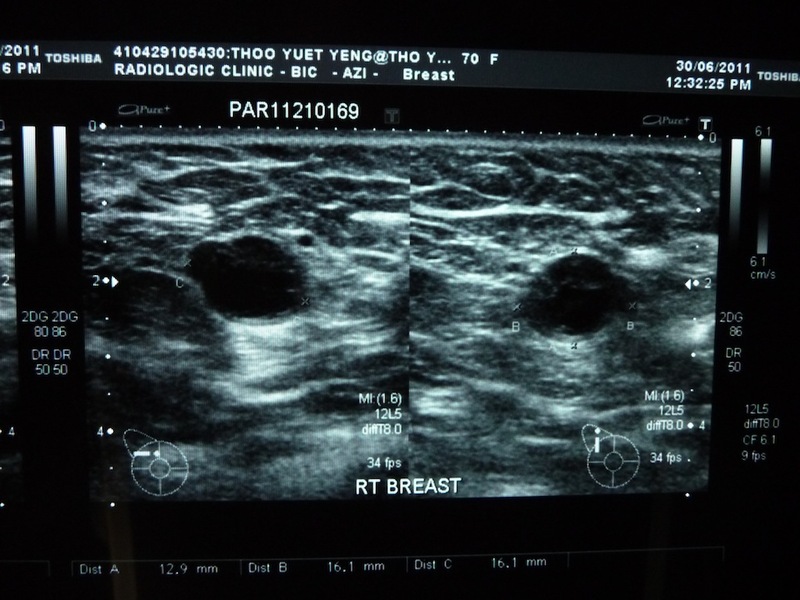 Ultrasound reports does not show the level of activity within the tumor - actively growing or dying. I don't want to jump to conclusion that my condition is out of danger. The Oncologist today said, "Ultrasound measurement only shows estimated sizes. Because it done by different specialists and different equipment, these results are only rough indications. Sometimes if a specialist pressed hard against the tumor it could flatten the tissues which result in a larger measurement. If the difference is less than 1cm, it is not an accurate comparison." Next step: The Oncologist recommended that I do a PET Scan on Monday. The SUV of the tumor would be the best indication of how active the tumor is, or not. After that, I can then determine if I need to do a top cut biopsy (tissue sample to determine the type of cancer). If PET Scan show no cancer activities, we may not need biopsy. 30 Jun 2011: The original Nodules: 2.14 x 1.97 x 1.89 cm and 1.46 x 1.63 x 1.2 cm about 7cm spread end-to-end.